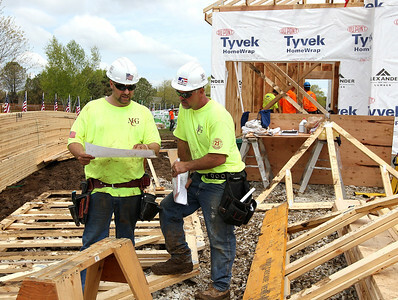 H. Rick Bamman - hbamman@shawmedia.com Manusos Contracting employees and volunteers Pat Londberg (left) of Genoa City and Isaac Moon of Spring Grove check the plans at A Soldier’s Journey Home project on Thursday, May 11, 2017 in Spring Grove. The custom mortgage-free home is being built for Anthony “Tony” Chobanov and his family. H. Rick Bamman - hbamman@shawmedia.com Volunteers swarm a A Soldier’s Journey Home project on Thursday, May 11, 2017. The custom mortgage-free home is being built for Anthony “Tony” Chobanov. Chobanov served as a Forward Observer in Afghanistan during Operation Enduring Freedom and in Iraq during Operation Iraqi Freedom. As a result of his service, he suffers from a Traumatic Brain Injury (TBI), Post Traumatic Stress Disorder (PTSD) and neurological injuries that make it difficult to maintain employment. Tony, his wife Abbey, and their four children, currently live in a home where the rent consumes two-thirds of their monthly income. H. Rick Bamman - hbamman@shawmedia.com Retired Navy Chief Matt Martin of Slidell, La. 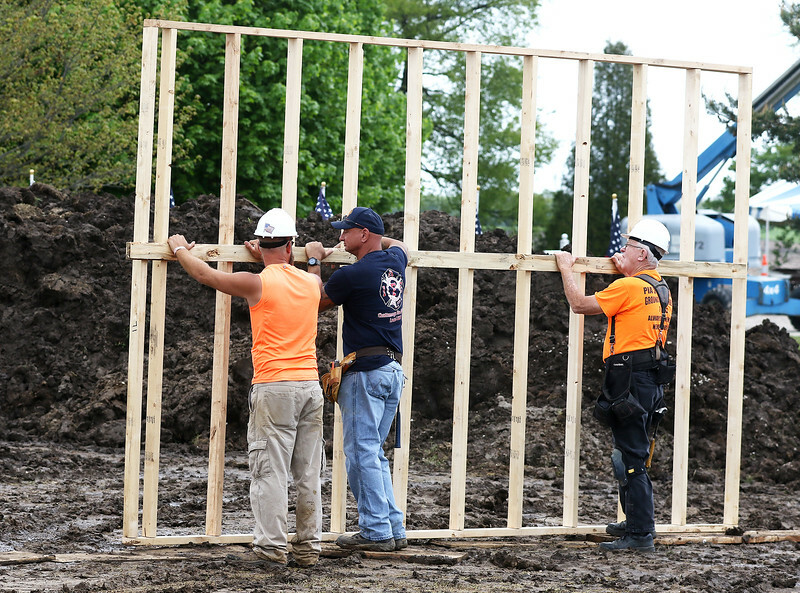 cuts lumber as volunteers frame a home Thursday, May 11, 2017 in Spring Grove. The A Soldier’s Journey Home project is a non-profit organization that builds specially adapted homes for members of the armed services with severe injuries. 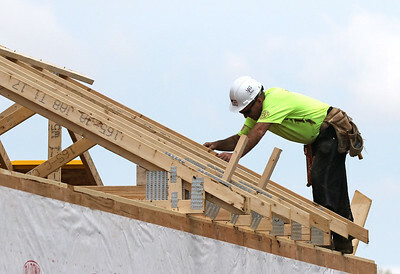 H. Rick Bamman - hbamman@shawmedia.com A Manusos Contracting employee and volunteer for A Soldier’s Journey Home project works on a roof truss Thursday, May 11, 2017 for a home being built for veteran Anthony “Tony” Chobanov and his family in Spring Grove. H. Rick Bamman - hbamman@shawmedia.com A Soldier’s Journey Home volunteers wait for a crane to lift part of a roof truss during a build project on Thursday, May 11, 2017 in Spring Grove. 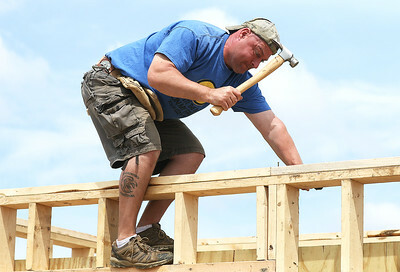 A Soldier’s Journey Home non-profit organization builds specially adapted homes. The custom mortgage-free home is being built for Anthony “Tony” Chobanov and his family. Chobanov served as a Forward Observer in Afghanistan during Operation Enduring Freedom and in Iraq during Operation Iraqi Freedom. H. Rick Bamman - hbamman@shawmedia.com Volunteers wheel an air conditioner to the build site during a A Soldier’s Journey Home project on Thursday, May 11, 2017. The custom mortgage-free home is being built for Anthony “Tony” Chobanov. Chobanov served as a Forward Observer in Afghanistan during Operation Enduring Freedom and in Iraq during Operation Iraqi Freedom. 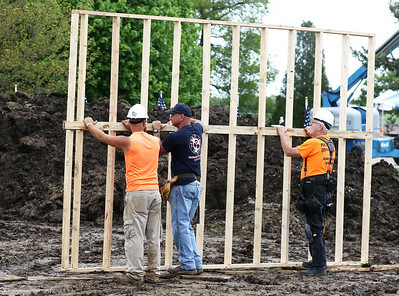 H. Rick Bamman - hbamman@shawmedia.com New Yprk firefighter Paddy Neville works on a frame for an interior wall Thursday, May 11, 2017 for the custom mortgage-free home being built for veteran Anthony “Tony” Chobanov and his family in Spring Grove. The build is part of A Soldier’s Journey Home project. Chobanov served as a Forward Observer in Afghanistan during Operation Enduring Freedom and in Iraq during Operation Iraqi Freedom. As a result of his service, he suffers from a Traumatic Brain Injury, Post Traumatic Stress Disorder and neurological injuries that make it difficult to maintain employment. Tony, his wife Abbey, and their four children, currently live in a home where the rent consumes two-thirds of their monthly income. 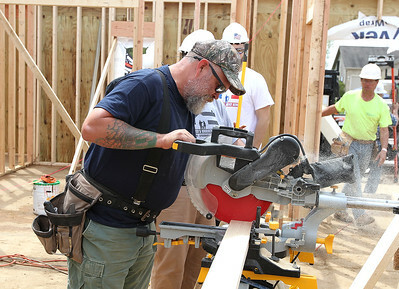 The new home will double the family’s disposable income, allowing Tony to focus on rehabilitation and recovery. 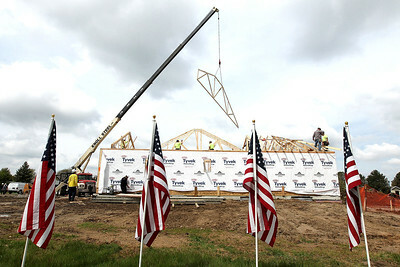 A Soldier’s Journey Home volunteers wait for a crane to lift part of a roof truss during a build project on Thursday, May 11, 2017 in Spring Grove. 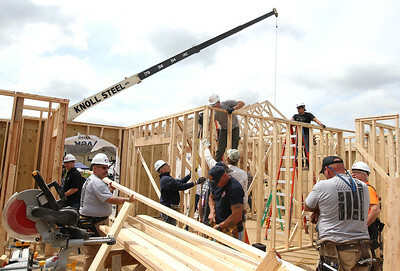 A Soldier’s Journey Home non-profit organization builds specially adapted homes. The custom mortgage-free home is being built for Anthony “Tony” Chobanov and his family. Chobanov served as a Forward Observer in Afghanistan during Operation Enduring Freedom and in Iraq during Operation Iraqi Freedom.